What is a stannary town? The word stannary comes from the Latin stannum, meaning tin. Stannary towns were towns where refined tin was checked for quality, weighed, stamped, and assessed for the payment of duty. 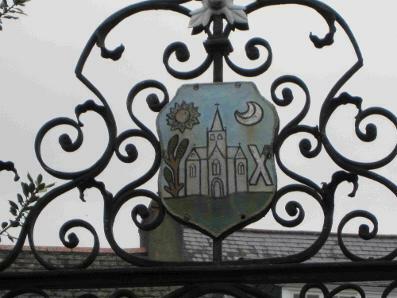 Devon's stannary towns were: Tavistock, Chagford, Ashburton and, later, Plympton. See the Quarries and mines section of Banks and businesses for more on this topic. Where is the Bull Ring? The Bull Ring is in the very centre of town, where North, West and East St meet. What do the symbols mean on the town crest ? The centre of the crest shows the Church of St Andrew*, together with the St Andrew's Cross. Wool was an important part of the town's wealth, and a teasel**, used for carding wool, is shown on the left hand side. The sun and the moon represent the copper and tin mining industries. What is a Portreeve? The portreeve is the ruler or chief officer of a town or borough. The word comes from the components 'port' meaning town, particularly a walled town or a market town, and 'reeve' meaning official. What is the Court Leet and Court Baron ? Both are ancient groups of officials whose responsibility was to ensure the smooth running of the town: a sort of local government. The Court Leet, composed of freeholders, elects the Portreeve and other officials such as Ale Tasters and Bread Weighers. The Court Baron is made up of tenants of the town and elects officials such as the Viewers of the Water Courses, Viewers of the Market, Tree Inspector, Scavengers and Pig Drovers. Today their role is largely ceremonial. What was Bulliver? Bulliver was the name of the railway engine that used to run on the Ashburton line. Hence Bulliver's Way, a walk parallel with Chuley Road, that follows the line of the old tracks. Where was Back Lane/ Cad Lane? Both of these are old names for Stapledon Lane, although there is now a small lane called Cad Lane leading off from Stapledon Lane. Where was Heavyhead Lane? Heavyhead Lane is now called Woodland Road. Where is the River Yeo? The Yeo is an old name for the River Ashburn - which is the river that can be seen from King's Bridge in the centre of town.